The world is a better place because you were here Officer Rex. God bless you Rex for your service. All dogs have a special place in heaven for their undying devotion and love. Service dogs are extra special. Thank you for your good and faithful service. You will have a special place in heaven. Thank you for your service! Praying for your family! 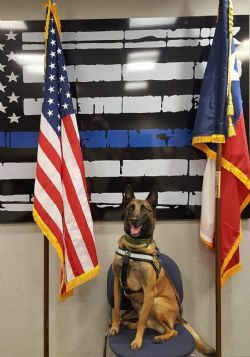 Thank you K9 Officer Rex, for your service in combatting crime, protecting our community and when the day was over, just being the sweetest heart to those around you. Although we grieve today, we know and celebrate the day when you will be waiting at Heaven's gate to greet us all and jump into your partner's arms. Peace be with you sweet puppy. You are so very loved and missed.